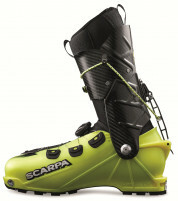 The extra-terrestrial design of the SCARPA Alien / Alien 1.0 boots has one major consequence of shaving all those grams: the liner is exposed to the elements. Remedies include wearing skin-tight suits with stirrups, using this handy gaiter, or only skiing in the summer. The simple waterproof membrane slides over your boot and helps keep out that annoyingly soft "powder" snow that nobody likes. And don't worry about hiding the important parts, as the designers were smart enough to allow you access to the BOA lacing and cuff lock systems while donning the gaiters. They also added reinforced scuff guards on the arches so you don't shred 'em on the first date. 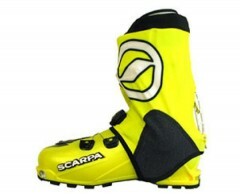 Go light for races but still opt for comfort on long tours with the gaiter. Hi Paddy, yeah SCARPA doesn't ship the gaiter with the boots. It's not very necessary with the Alien 0.0...it can help a little but the boot isn't 100% water tight even with it. Background on product familiarity: For my Alien 1.0 size 26 boots, I have the size Small in the gaiter – actually, two pairs of gaiters, but more on that under the final section of this review. First, the first impressions out of the box: I already spent so much money on my boots, yet now I need to spend still more on a separate gaiter? Yes. For backcountry skiing in anything but a skimo suit with integrated gaiters, even with the good coverage of something like the Dynafit Movement pant/tight, the Alien 1.0 still lets in astounding excessive amounts of powder during the winter or wet snow during the spring. Okay, well, at least this gaiter sure is beautifully designed and nearly weightless. But how do I get it on my boots? 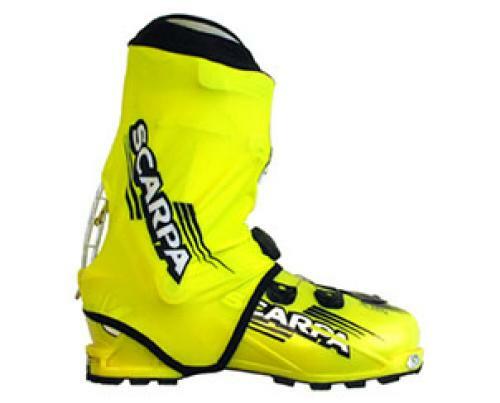 1) Pull gaiter up over your calves before putting on your boot. 2) Set up the boot in tour mode, then slide the gaiter all the way down over the boot until it’s bunched up around the cuff rivets. 3) Loop the gaiter’s elastic strap down around the boot sole instep. 4) Pull the front hole of the gaiter over the Boa adjustment knob. 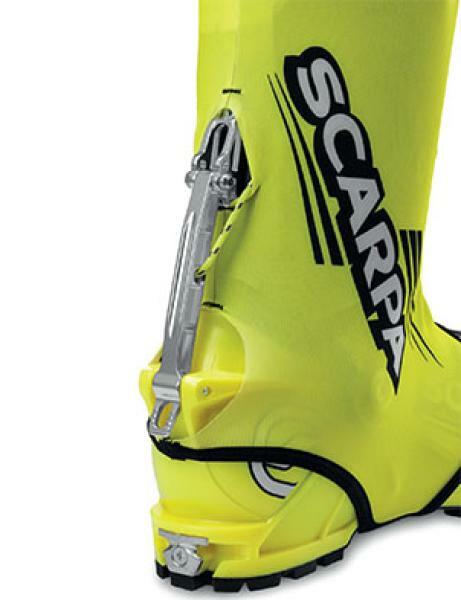 5) Pull up the back of the gaiter so that the walk-ski lever slides through the small hole. Second impressions, in use: In short, it works as designed. Snow and waiter ingress goes from unacceptably excessive to just typical. Third impressions, for long-term durability: The amazing off-snow durability of the Alien 1.0 unfortunately leads to abuse of the gaiter. For any extended rock scrambling or hiking, you need to keep the gaiter pulled back up over the ankle area of the boot. Otherwise, all the cumulative rock hits to the lower sides of the boot will eventually shred the lycra (currently undergoing an extended mending attempt by Mom, unless she gives up in protest). Once I learned that the hard way, I bought only a second pair, only to realize that the reinforced area is vulnerable to premature wear from my boot crampon straps (CAMP Race 290). After only two ascents of about 760’ vertical each, some part of the strap had worn a small hole through the reinforcement on each gaiter. Fortunately this hole is very small, and it happens to be in the reinforcement fabric that can take lots of abuse before threatening the overall integrity of the gaiter. How might I get my hands on a pair of these to fit size 27 aliens? Hi Aaron, unfortunately we are sold out of the larges for the season but will be getting more in the fall. Thanks for checking. Essential for keeping snow out - I had wet feet every single time I skied anything other than groomers until I got a pair of gaiters for my Aliens. And the gaiters work pretty well, snow ingress is reduced about 97% whether booting or skinning. Downsides though: the material other than the scuff guard is flimsy and light. Ideal from a weight and flexibility perspective, but it tears or nicks up pretty easily when faced with metal edges, rocks during scrambling, hard living on a barstool, etc. Expect to do some stitching repair jobs. Also, (carefully) pulling the gaiters on over the boots is a process that costs a few minutes on both ends of a tour, and is necessary with the Alien 1.0. One can leave the gaiters on the boot when using the plastic Alien, since that boot allows one's foot to exit the shell without the liner on it, unlike the 1.0.